I think I'm posting a lot about food because I will be fed through a tube for a while in Houston. Anyhow, here's a picture of my breakfast! Underneath the crawfish sauce are two over easy eggs. Remember, no one is forcing you to read this blog. 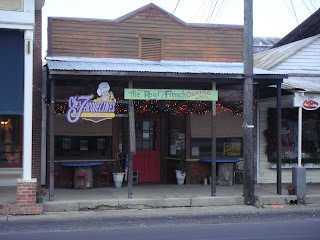 I intend to return to Breaux Bridge some day, it was quite a find. Ah the land of cotton! Seeing your posts reminds me of a year i lived on the Gulf of Mississippi and how i had some of the best meals of my life! Catfish! Cajun dishes!Seafood!Biscuits and gravy!and those shrimp!!! not fair you know I'm on steroids right now! I also remember a redneck shrimp fisherman at a bar ask me..."do you know what the difference between a Yankee and a damn Yankee is? "I said i did not...he replied..."a damn Yankee stays here!" I don't think he liked me! Do not be fooled by that Southern charm!